I was in Munich (Capital of Bavarian province in Germany) last week due to work and experienced my first ever snowfall! Even for someone who hates cold, the experience was a happy one. I suppose the company of new friends and tall mugs of Gluhwein (Mulled Wine) did help loads. I had just one morning and afternoon to do some sight-seeing and decided on a hop-on hop-off bus tour. I have come to realise that when you want to cover a lot of ground in a short time, these tours are the best. For business travellers looking to do a bit of sight-seeing in a new city, these tours are a God send. Hotels will generally check you in post lunch. So if you arrive early in the morning and plan to use the time sight-seeing, the Munich airport has a shower facility. It would be a good idea to check before hand with your hotel if they have the same. If not, shower at the airport! Even at 8 in the morning with temperature dipping to 2 degrees the day I arrived, the place was buzzing with people. Not the Mumbai kinda buzz though! There were lots of locals and tourists about. The city centre is very well-connected by train, subway and trams! I saw loads of trams around the station. There were also quite a few public buses plying about. So no matter where in the city your hotel is, getting to the city centre should be easy enough. By about 9 am, a feeble sun started shining and I had breakfast at a local café. 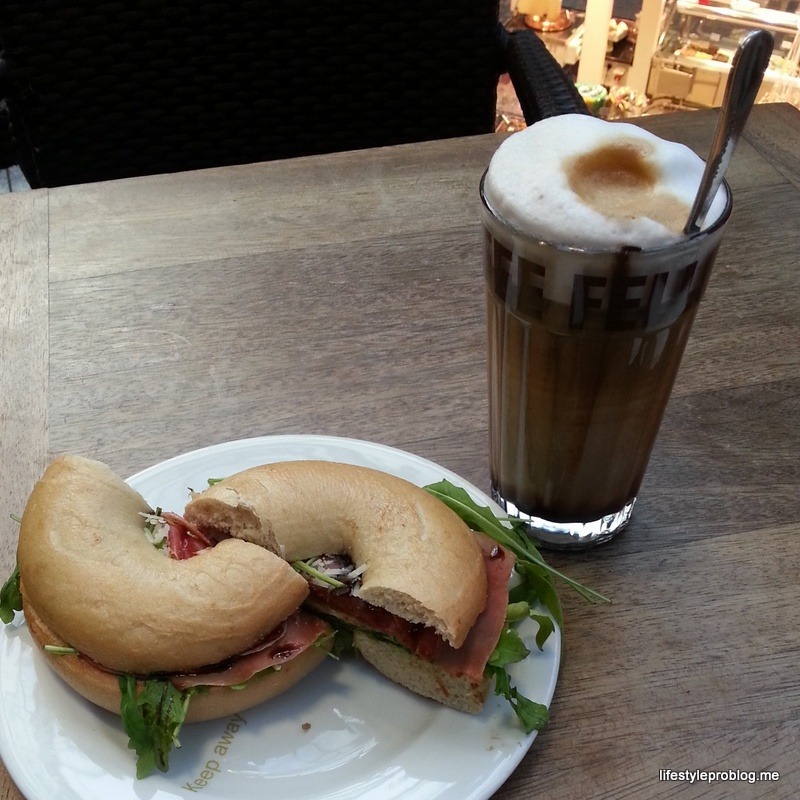 A bagel and a special winter drink called Sultan’s Delight! It was a warm mocha with hazel nut syrup, whipped cream and chocolate syrup. Yumm Yumm! I ate at a cafe called Coffee Fellows. There are loads of eating options in and around the train station and you can find everything from sandwiches to burgers to noodles to pizza out there. After that, I bought a new sim for my phone and walked in to a telecom shop. This was owned and run by Indians and when the attendent saw my Docomo sim, he started singing the docomo jingle! You know the one that goes Do Co Mooooo…. 🙂 We got talking in Hindi and he told me that the Hop-On and Hop-Off starts right outside the station and I should go for that because I had very little time. I needed no convincing and was out of the door in minutes. Munich city centre has a charming collection of old buildings with a varied architecture. There were Greek and Roman as well as Victorian influences. These included churches, museums, Government buildings, squares and even a palace! There is a walking tour available too and if you are up to it, the entire place can be covered on foot. 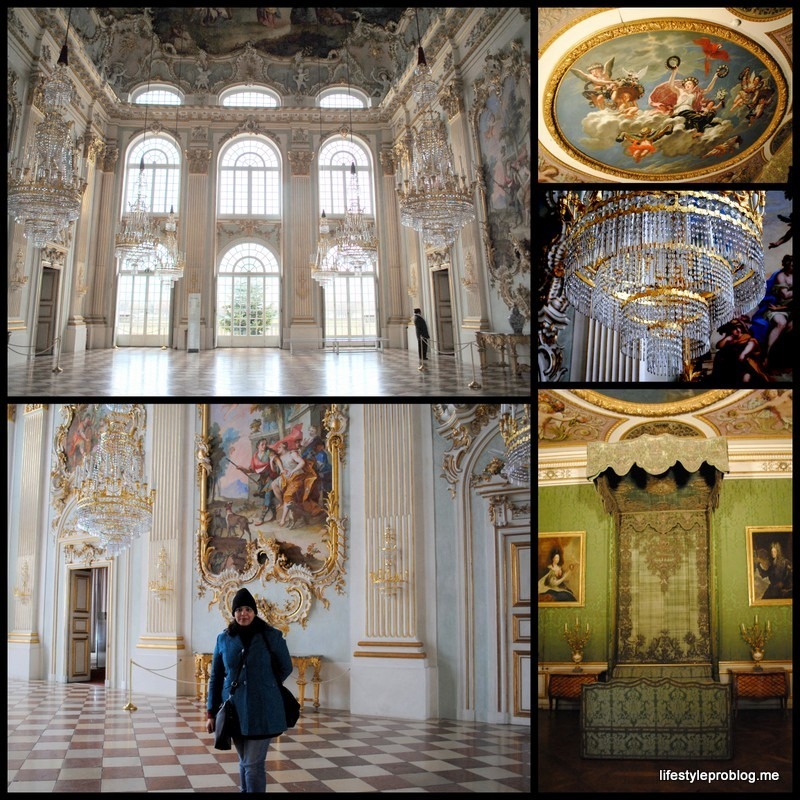 I hopped off the bus to visit Residenz or the winter palace. It was freezing and I spent about 10 minutes exploring the place.What shocked me was the lack of people there! There were hardly 3-4 tourists around. This was 10.30 am. Right outside the palace is a square where a Christmas market is set up. I found loads of Christmas trees and wreaths being sold there. From this stop, I decided to walk to the next one. The woman at the information centre had advised me to do so saying it is a charming walk. I ended up walking through the pedestrian streets and markets all the way from stop number 3 (where I got off for Residenz) to stop number 6! 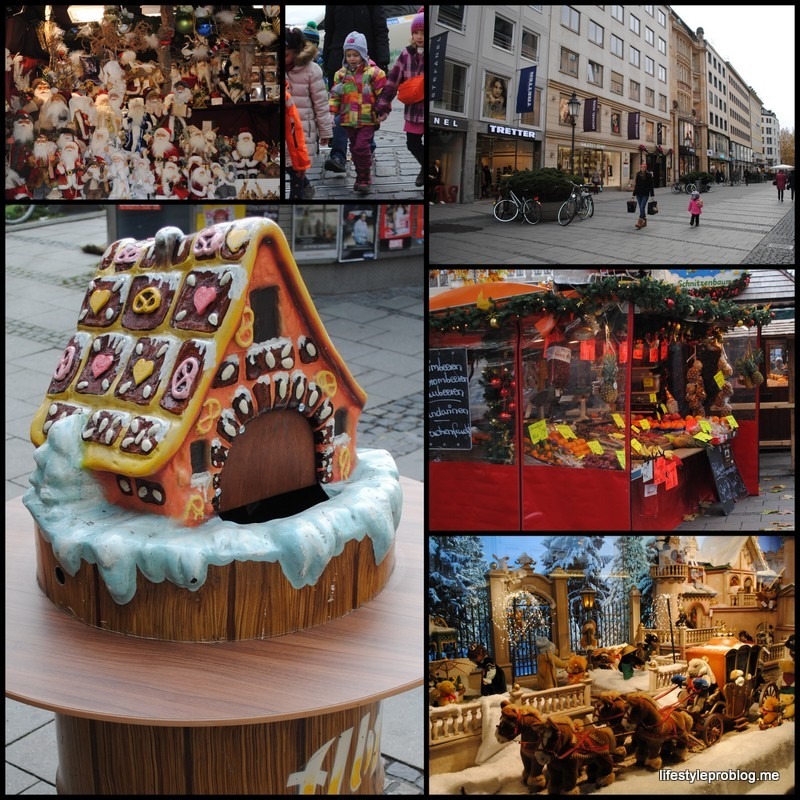 I found high street shopping district, charming christmas markets and a basically decked up area. In the cold cold weather, it was a very different experience. I enjoyed the walk immensely! I reached Marienplatz halfway through my walk. 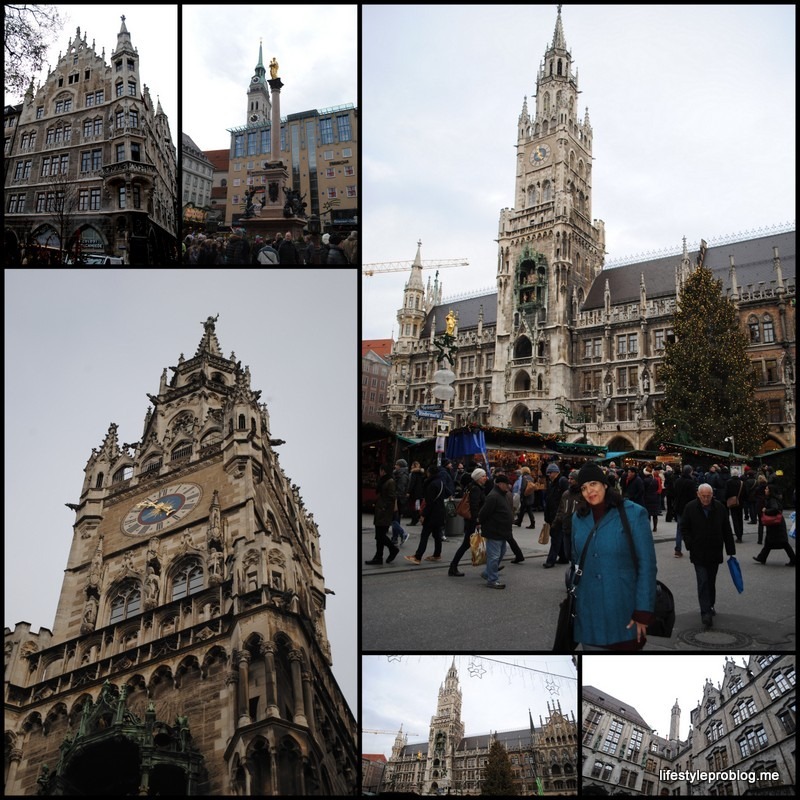 It is Munich;s main Square and is also famous for its clock tower. I was fortunate to reach it just before 11 am. Every weekday at 11 and 12 in the morning, the tower bells chime and life-sized dolls in the tower dance to the music! It is a one of its kind experience and a must watch in my opinion. I got back on the bus with a bit of difficulty. Since I walked around the city center from one Hop-Off stop to another, I did not know the exact pick up point at the other destination. In case you are planning to do that, make sure you ask your tour guide about the exact location of the subsequent stops. I walked back to the starting point since it was about 600 meters from where I was standing. Once there, I was just in time for the next bus. I got into the bus and we left to Nymphenburg palace or the summer palace. This is a beautiful palace with ponds, fountains and gardens. It houses 3 museums. The day I visited, only one of them was open and I could only see the main palace wing. The entry ticket was 6 Euro. The palace wings and chambers give you a true idea of what royal luxury must have felt like! There is a huge Olympic Park that houses an auditorium. There was a Bryan Adams concert the day I was doing this tour! 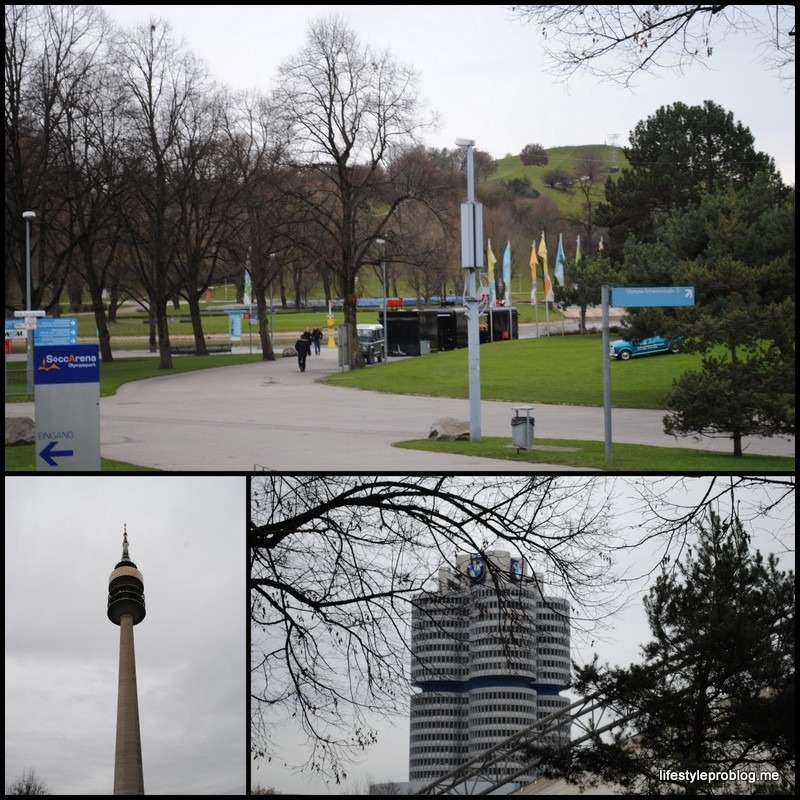 The TV Tower and Sealife park is also housed there. This park is right opposite the Iconic BMW tower which is shaped like a 4 cylinder car engine. Munich was a meat lovers paradise. It seems like all I ate there was sausages, pork and potatoes! Traditional Bavarian cuisine seemed a little bland to my Indian palate. However, there are lots of fast food options available. I had awesome Doner Kebabs and some good Pho and sushi as well. Munich is the home of Oktoberfest and so beer is drunk like water! We visited a beer hall called Speisen Karte that had a seating capacity of over 1000 people. There was a stage where a traditional band was playing live music. Dancers also performed their routines and kept the party goers entertained. 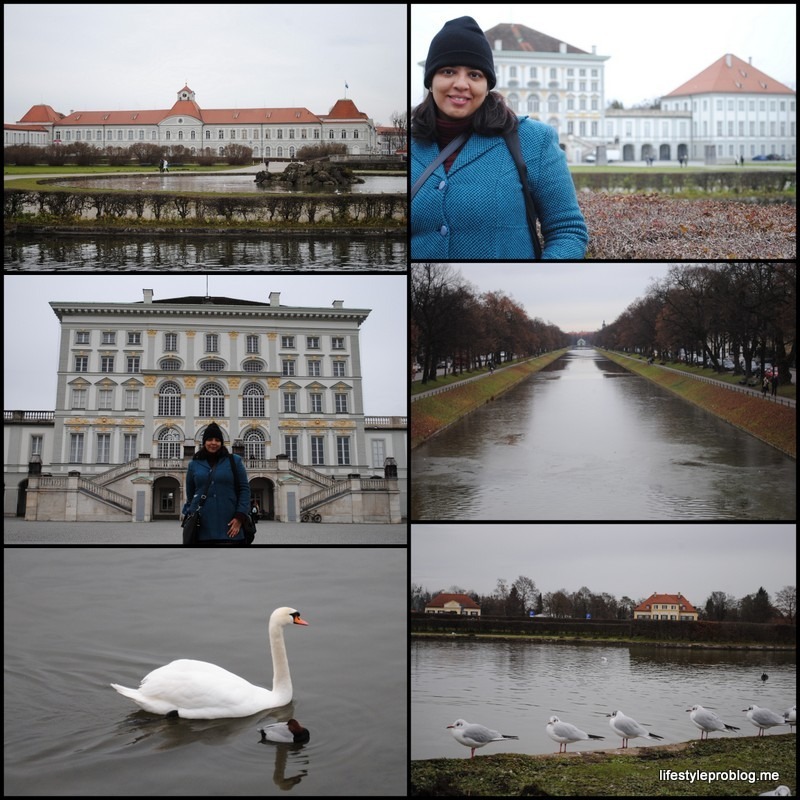 That’s all from my Munich Sightseeing Diaries… till the next trip… Ciao! This is such a pretty city. I have been wanting to head there from forever. Grab the chance when you get it. A bummer that I only got a few hours. I would love to go again during Christmas. The Christmas markets were delightful! 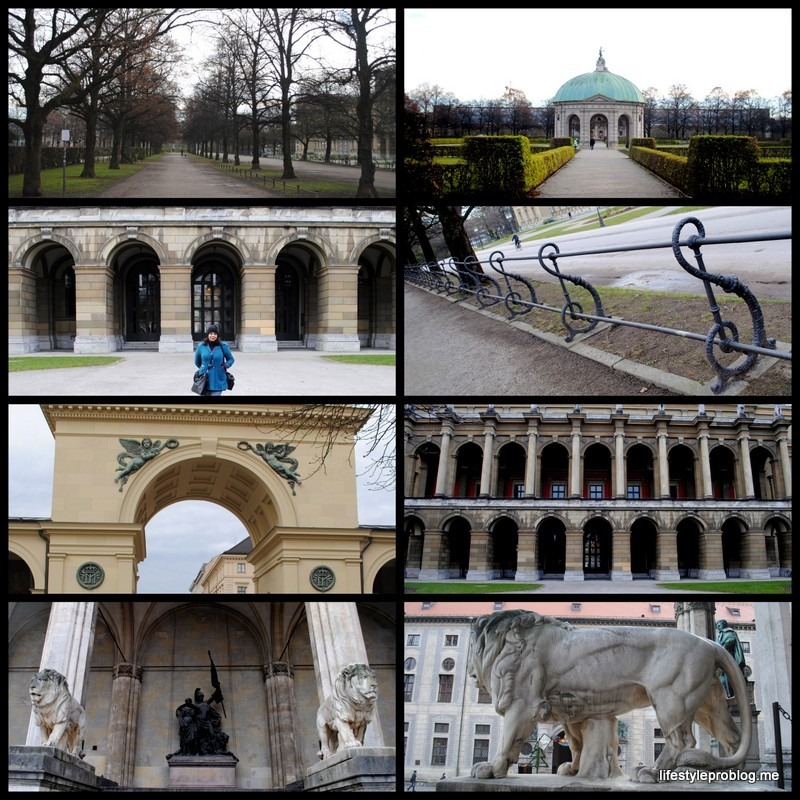 Thanks for a virtual Munich sightseeing 🙂 Nice Post!